Solar power is energy from the sun that is converted into thermal or electrical energy. Solar energy is the cleanest and most abundant renewable energy source available. Since beginning VERSOL has been oriented towards research and development of Solar Panels aiming to recover the free energy available in the world. 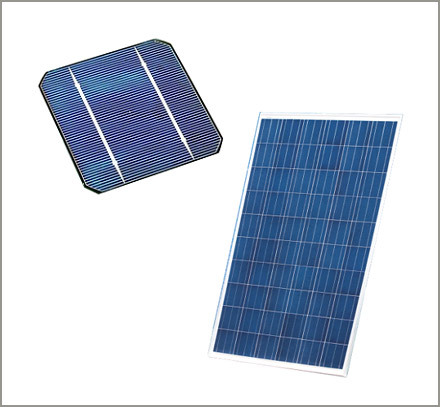 VERSOL developed many models of panels for Thermal and electric applications which are tested and certified by worldwide agencies like TUV, DIN certco. Most of our panels are with Solar KEYMARK certificates and we offer 10 Years warranty for the panels. VERSOSUN, based on application divided to Three ranges as below. VERSOL solar thermal collector are designed for the exchange of the solar radiation energy to the useful thermal energy applied to prepare warm functional water, to heating water in swimming-pool or for the assistance for the source of the warmth in the heating installation. The structure of the casing of the collector is based on the stiff frame bent from the special, VERSOL patented aluminium profile secured through the process of anodization. The casing is closed from the bottom with aluminium metal sheet, whereas the lid is made from the special, high permeable solar glass. The way of fixing the pane guarantees the airtightness of the casing and minimizes thermal stresses.An absorber is the main element of the collector. Its plate is made of copper or aluminum sheets, coated with the high selective, ceramic metal cover eta plus with an aim of providing high level of radiation absorption and, consequently, of getting the great efficiency in the transformation of the energy process.The plate of the absorber is connected with the system of copper or aluminium tubes, in which the working substance is circulating, with the use of the method of ultrasonic welding or soldering.Losses of the warmth were minimized by applying the bottom and side isolation made of the rock wool with the low thermal conduction.Specially designed assembly sets, made of the stainless steel or alumiunium elements, make the mounting of the collectors on roof structures with different pitches easy and solid. Made according to DIN EN 12975. Photovoltaics is a technology of collecting solar energy and converting it into electrical power. In other words, it is generating electrical power from sunlight. This process is conducted in photovoltaic cells through photovoltaic effect. The basic element of a photovoltaic installation is a photovoltaic cell. It is a semiconductor consisting of 2 layers separated by the barrier (p-n connection). In one layer (n layer) there is an excess, and in the other (p layer) a shortage of electrons. When some amount of solar energy (photons) is supplied to the photovoltaic cell, in the place where semiconductors connect a pair of carriers with opposite electrical charges, which are separated by the electrical field, is created. The separation of charges creates a voltage in a cell. A photovoltaic cell (PV cell) is a basic element of a photovoltaic system. A single cell produces between 1-2 W. PV cells are very fragile, that’s why they cannot exist on their own, and are connected in bigger units. For creating higher voltages or currents, cells are connected in a series or parallel way, creating a photovoltaic module. VERSOL Hybrid collector PV-T 2,0 is a combination of a flat solar collector with a photovoltaic module with polycrystalline silicone cells. 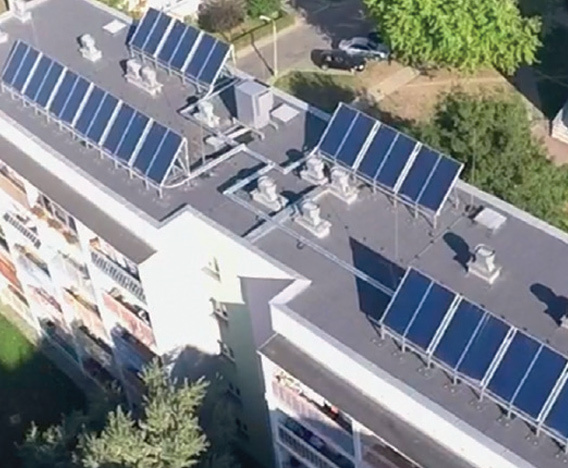 Solar collector is responsible for conversion of a solar radiation into thermal energy used for domestic hot water and central heating, whereas photovoltaic modules transform solar energy into electrical energy. 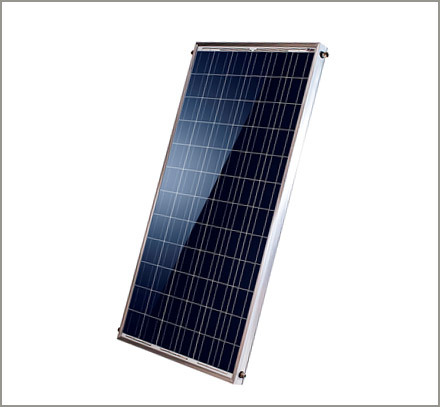 Maximum power of a photovoltaic module is 300 W. Collector is framed in a special, patented aluminium profile.